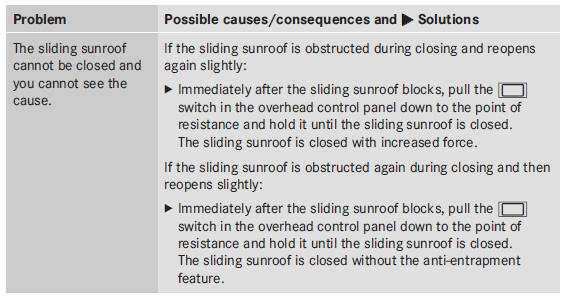 If you close the sliding sunroof again immediately after it has been blocked or reset, the sliding sunroof closes with increased or maximum force. The reversing feature is then not active. Parts of the body could be trapped in the closing area in the process. This poses an increased risk of injury or even fatal injury. Make sure that no parts of the body are in the closing area. Your vehicle may be equipped with a sliding sunroof or a panorama roof with power tilt/sliding panel. In this section, the term "sliding sunroof" refers to both types of sliding sunroof.